This guide is particularly handy if WordPress was originally installed in a subdirectory and you wish to move it to your main domain. While we do provide this guide to you, third party applications do fall outside the scope of our Technical Support. We recommend contacting your developer, or the WordPress community for direct assistance. Important: Please use these instructions with caution. If you already have a website in your public_html folder (or have WP currently as an addon/subdomain), things may break and can cause unforeseen downtime to your website. If in doubt, please contact our 24/7 Australian based technical support team before proceeding. 1. Log into your WordPress dashboard. You can do this by going to www.exampledomainname.com/wp-admin (exampledomainname being your own domain name). 2. 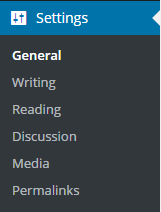 Click Settings on the left navigation menu bar. 3. Change the WordPress Address and Site Address fields to wherever you’re moving the site to. For instance, you might simply take out the ‘wp’ at the end of the URLs. 4. Log into cPanel, then select the File Manager. 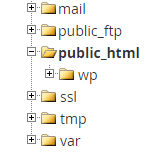 If prompted, select the public_html folder and click Go (otherwise, just click public_html when File Manager loads). 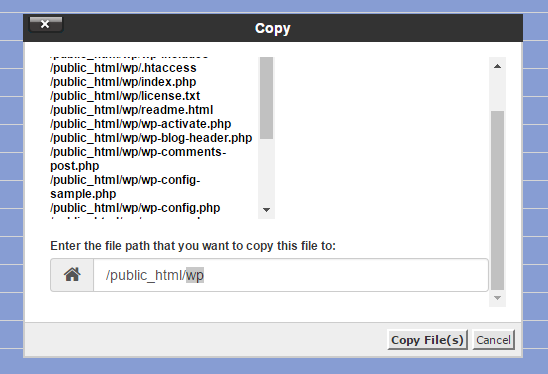 5) Double click on the folder with WordPress in it (wp for instance) to open the folder. 6) Select all of the files and folders (click ‘Select All’), then click Copy. 7) Change the path as you need to. Keep in mind the public_html is equivalent to www.yourdomain.com and needs to be in the path. If you’re moving it out of the wp folder, just take out the wp. Click Copy File(s). 8) You should be all set! The original files are still there (in the subfolder), just in case anything went wrong and you need to re-copy them.